The Storming of The Bastille. 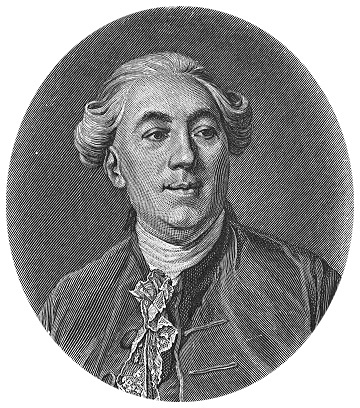 Jean-Pierre Houel, 1789. 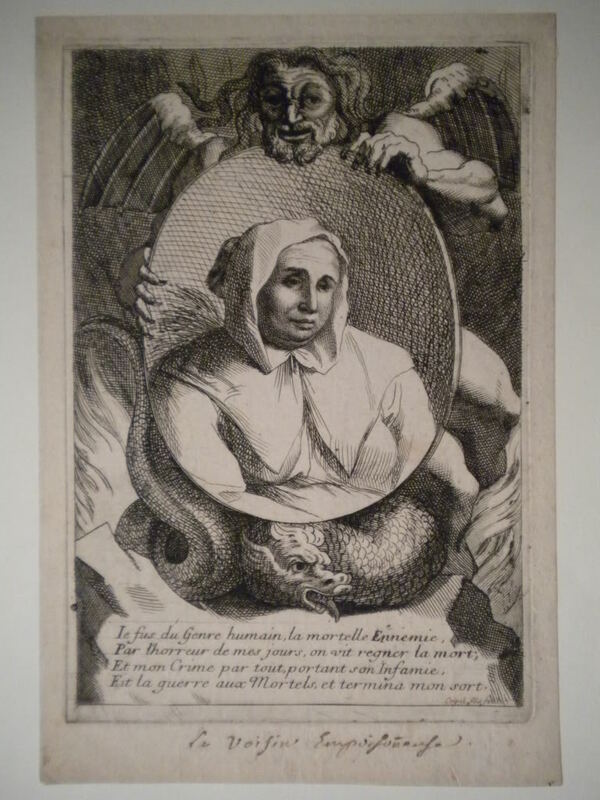 When the French Revolution features in art and literature, the bias tends to favor the royalty over the common people; the specter of Madame Guillotine casts a shadow that can still be seen today, and in our sympathy for the tragic figures who lost their lives, the grievances and casualties of the public are routinely overlooked. It was not a misunderstanding about cake that led to the French Revolution. When the Bastille was stormed on July 14th, 1789, it was a long time coming. The social classes were divided into three estates: the First Estate was the Roman Catholic clergy, the Second Estate was the King and the nobility, and the Third Estate represented everyone else. Class was determined entirely by birth, and Louis XVI was an absolute monarch with no real limits to his power. By 1789, there were thirty million people living in France. France was still a feudal society, so the eighty percent of the population living off of the land in rural areas were obliged to rent it from the nobility. They were taxed heavily and most of them lived below subsistence and had for generations. 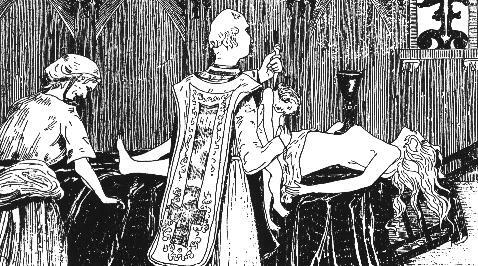 The nobility, the clergy, and government officials were entirely tax exempt. More than a century earlier in 1664, Louis XIV’s Minister of Finance, Jean-Baptiste Colbert, wrote that there were 46,000 people working in the departments of finance and justice alone, of which 40,000 were largely redundant, having purchased sinecures for the sole purpose of avoiding paying taxes. Only the Third Estate paid taxes, so the poorest ninety-seven percent of the country supported the top three percent. The taxes the peasants paid were not used for their benefit, and the fees could change arbitrarily from year to year. Peasants seen to be existing above subsistence level habitually had their taxes doubled. As Lewis assures us, the fees were as high as the government thought they could be without inspiring open revolt. The money collected from the peasants was kept by the nobility with the exception of the salt tax, which was given to the King. In perhaps the most obvious example of the failure of trickle-down economics, the nobility frittered away fortunes in Versailles while the peasants who made this extravagance possible were dying in the fields outside. Strapped for cash after assisting in the American War of Independence, Louis attempted to compel his nobility to relinquish more of the taxes they collected to the government. They refused. On June 7th, 1788, parliament also refused the King’s request for a loan to cover the deficit and they were all fired. The parliamentarians of Grenoble, where this took place, protested this action by rejecting the King’s dismissal. The soldiers sent to break up the crowd were met with hostility and projectiles, and the parliamentarians doubled down by refusing to pay taxes to the King and calling on the other regions to do likewise. Out of options, the King called the Estates General Meeting, a gathering of representatives from the three estates at Versailles. Although the Third Estate represented ninety-seven percent of the country, the balance of power was weighted against them and they could easily be outvoted on any issue by the First and Second. Taking this into consideration, they asked for twice the representation and this request was granted by Necker, the King’s finance minister, adding to the popularity he had gained by supporting the parliamentarians at Grenoble. The Third Estate’s hopes of a fair hearing for their grievances was dashed when they discovered that their extra representation would count for nothing; although they had twice the representation as promised, the Third Estate would still receive only one vote. The gesture was an empty one. When Necker made the ridiculous suggestion that the clergy and nobility should also pay taxes, the nobility turned against the King. The Third Estate was represented at this meeting by Robespierre, a young lawyer devoted to helping the millions of poor. Having lost faith with the political process, Robespierre and prominent members of the Third Estate established themselves as the National Assembly, and called on representatives from the other two estates to join them for a meeting of their own. They did, and together they decided to write a constitution for the people of France. The King was not invited. Arrest of de Launay. Jean-Baptiste Lallemand, 1790. Notice the smoking cannon aimed at the crowd. The National Assembly became the National Constituent Assembly on July 9th, 1789. Three days later, the King fired Necker. The King had not only replaced Necker with the militaristic Baron de Breteuil, but he had also sent twenty thousand troops to march on Paris to deal with the protesters. The news was delivered first hand by reporter Camille Desmoulins who had rushed back to Paris from Versailles to address the crowds at the Palais-Royal. Unfortunately for Louis, Necker was very popular among the Third Estate. He had listened to them when no one else of his class would, and he had been the one to propose taxing the wealthy. Even the Paris troops demanded his reinstatement, and refused to fire on the protesters. 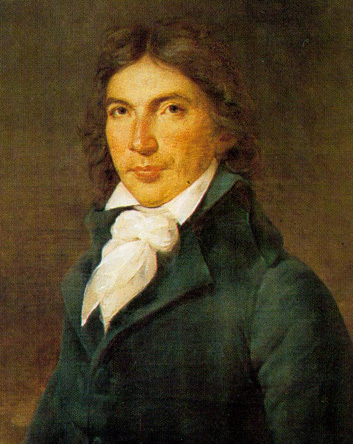 Camille Desmoulins, journalist fond of “artfully placed semicolons” and giving impassioned speeches on cafe tables. 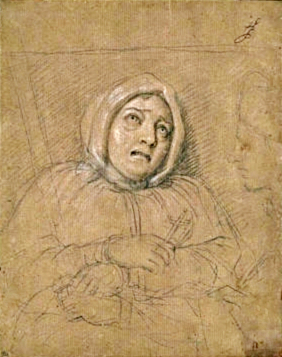 Desmoulins’ words had some effect; crowds marched on the Abbaye prison to free several guardsmen who had been jailed for refusing to fire on the protesters. Theater performances were cancelled out of respect for the uprising. A people’s militia was formed and had more than thirteen thousand volunteers just to start, and its numbers swelled to perhaps fifty thousand before long. As terrifying as fifty thousand angry people must have been, they wouldn’t have much of a chance against the King’s army without weapons. 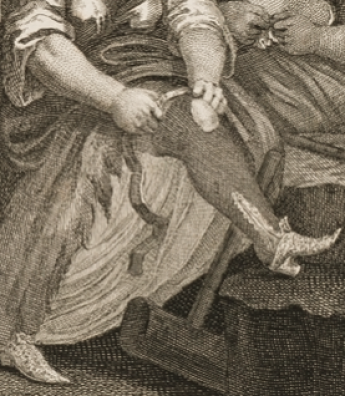 We take for granted the availability of weapons today, but they were much harder to come by in eighteenth century France. In need of means of defense, crowds marched on the Hotel des Invalides and took thirty thousand muskets. Desperate, they even took items from the museum in the Place Louis XV, including a crossbow that had previously belonged to Henri IV. The Bastille mainly held political prisoners at the pleasure of the King and without benefit of trial, so it had come to be seen as a symbol of the tyranny of the Bourbon monarchs in the heart of the poor district of St-Antoine. It was a natural target. It also held a truly spectacular amount of gunpowder. The Bastille was seen as impenetrable, and hundreds of barrels of gunpowder had recently been moved behind the drawbridge for safe keeping. Early in the morning of July 14th, a crowd of perhaps one thousand tradesmen approached the gates and demanded the gunpowder. De Launay, the prison Governor, invited a group of them inside for breakfast to kill time while reports of approaching royalist troops spread throughout the city. The breakfast went on for three hours while the rest of the crowd waited outside until one man managed to climb onto the drawbridge from the roof of a neighboring shop and cut its chains, allowing the protesters to cross into the outer courtyard. Breakfast negotiations were cut short and before long, de Launay had cannon fired into the crowd. Violence is never an appropriate way to respond to protest, and firing cannonballs into a crowd of demonstrators drew the wrong kind of attention. 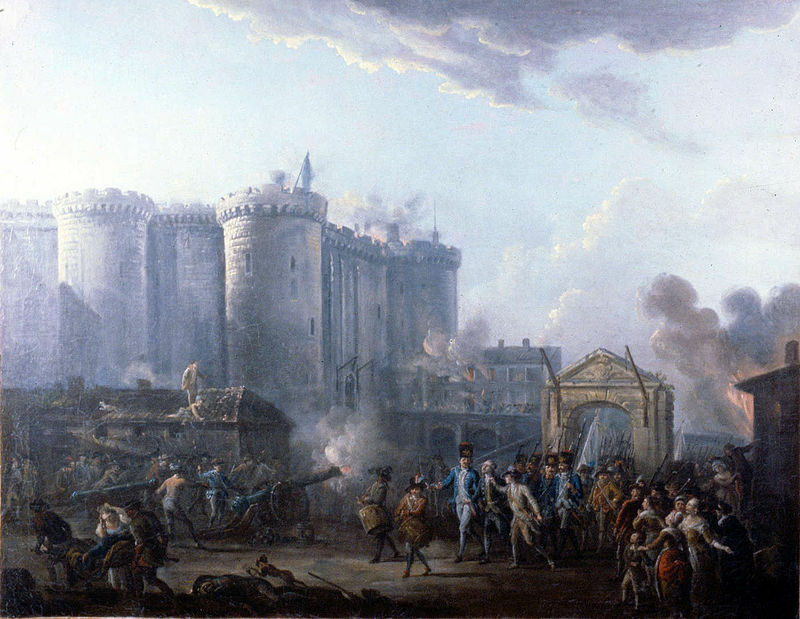 Many French Guards rushed to the Bastille to defend the protesters, and a Swiss Guard inside handed a set of keys to a rebel through a hole in the wall. They passed through the second drawbridge, but were forced to use a plank to cross the moat on the other side. Nevertheless, they made it through. Only six Bastille guards were killed to the protesters’ staggering ninety-four, and de Launay’s head was cut off by an unemployed cook. 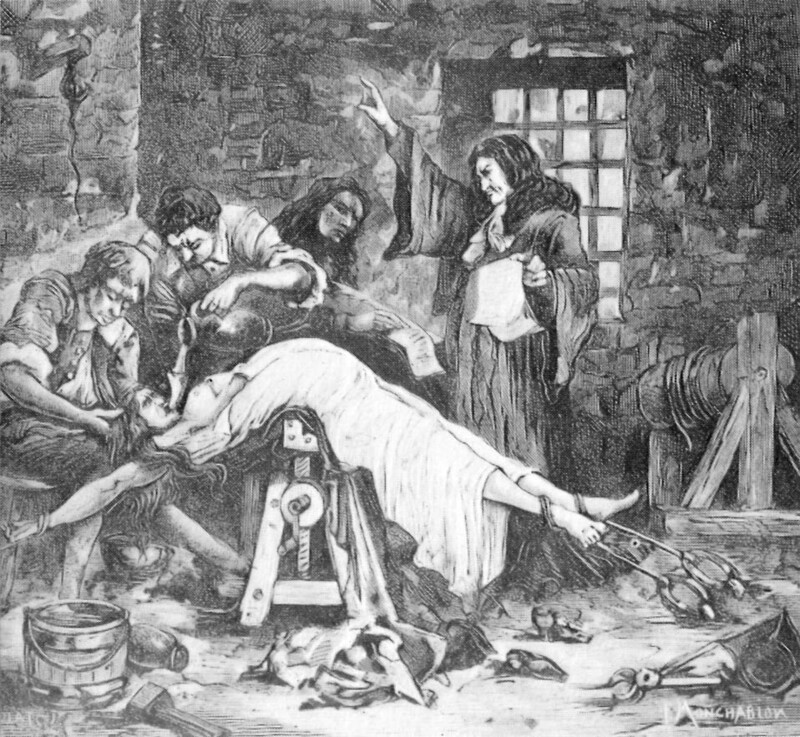 All seven prisoners of the Bastille were freed. The Marquis de Sade would have been one of them, but he had been moved to another location the week before. Following the events of July 14th, the King reinstated Necker and formally recognized the National Assembly. Lafayette was appointed head of the newly formed National Guard consisting of the police and army, and the Paris Commune was formed. 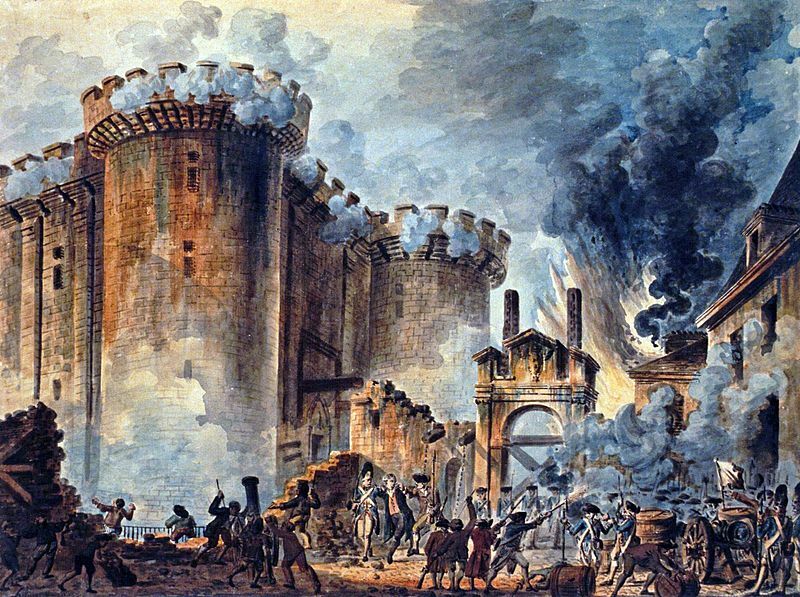 The Déclaration des Droits de l’Homme et du Citoyen (Declaration of the Rights of Man and of the Citizen) was issued August 26th, the medieval system of feudalism was abolished August 4th, and the Bastille was demolished by February 1790. The abolition of the monarchy followed in 1792, and Louis XVI and Marie-Antoinette were executed for treason in 1793. Lewis, W.H. 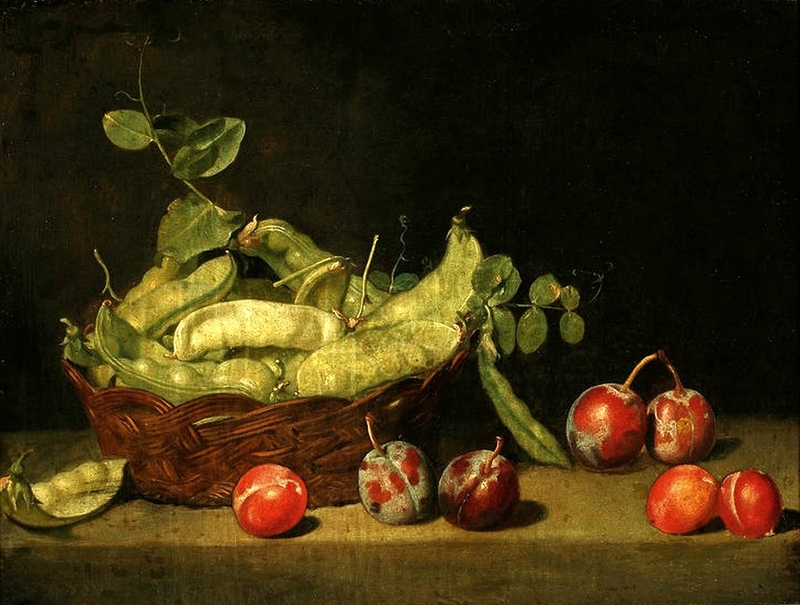 The Splendid Century: Life in the France of Louis XIV. William Morrow & Co, 1953. Steel, Mark. Vive La Revolution. Haymarket Books, 2003. At one, the King would eat au petit couvert, au grand couvert, or au public. Watching Louis dine au public was a popular pastime, and any well-dressed person could be admitted. 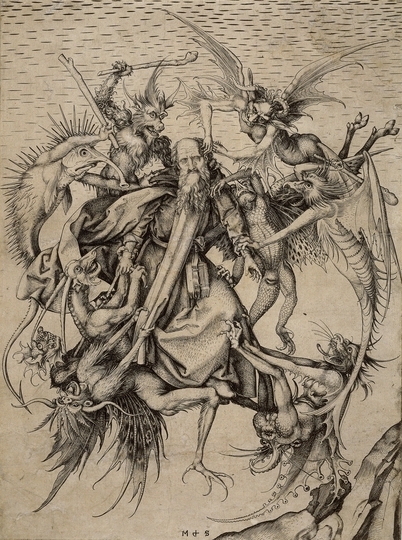 They were not allowed to stare at the King, however, and were led through one door and out another, moving past the King’s table in an orderly queue. Louis rarely dined in public, and prefered to eat au petit couvert in the privacy of his rooms. Even in private, the ceremony was considerable. After they were tasted by the maitre d’hotel and the Equerry of the Kitchen, thirty or forty dishes were carried from the kitchen in the rue de la Surintendance across the street and through the palace to the King’s rooms with a formal entourage of more than a dozen people known as the cortege de la viande de Sa Majeste.